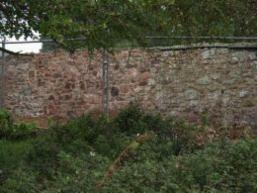 The above shows a very weathered wall with a collapsed area ready for rebuilding. New aggregate was used to match the original lime mortar; The latter being recycled into the mix as the gap was repaired. It's found in older walls before cement mortars were widly used and has it's own properties which effect how the wall performs. Lime is made by heating limestone or chalk in a kiln. The resulting white residue is then slaked in water to create lime putty, which has the consistency of thick cream. Other forms are dried and bagged as a powder. These are known as naturally hydraulic ( not hydrated) limes. The lime is then mixed with a range of aggregates to obtain the correct mix and colour. No cement need be used in the mix. Why is it specified for older walls? Lime mortar will take up moisture, but also lets moisture evaporate from it's surface. It offers a degree of flexibility which allows it to stay in place as older walls do tend to bow and flex. Many have very rudimenatry foundations. Because it can be time consuming to apply, and cure it fell out of favour in preference for cement based mortars. 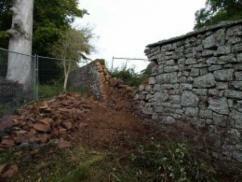 Over the years many older walls have been repaired or repointed with cement based mortars. However these later mortars tend to condemn a lime based wall to a slow death as small cracks develop that let water in. That water then cannot subsequently evaporate because the cement mortar acts a s a barrier. The result is that the middle of the wall stays continually damp and eventually gently falls apart, followed by the harder cement pointing and then the stones! It would be wrong to blame those who have repaired these walls in the past, as they were using what was 'new' at the time. With passage of time though the damage caused has become apparent. There is some suggestion that lime mortar may be slightly more environmentally friendly than it's cement based counterparts. This is because part of the curing process involves the uptake of atmospheric CO2 but bear in mind quite a lot of that would have been created in its manufacture in the first place. I won't bang that drum too loudly. Perhaps my favourite reasons for using it however is that it has such a beautifully soft finish - something to do with the refraction of light from the many different sizes of aggregates used in the mix. Where an old wall has collapsed the softer lime mortar used can be brushed off the stone so that nearly all the stone can be reused. In fact is is common practice to bag up the old dusty mortar and use it in the new mixes - saves dramatically both on waste and the quantity of new aggregates required.